In the previous video, we had a very in depth approach to what ingredients make up the GMAT passage. In this video, I'm gonna take a step back and talk more about a high level strategy, and how to approach the passage. So we're gonna start with, as soon as you see the passage, what should you do? It make seem obvious that you read the passage first. However, oftentimes there are different prep sources that recommend reading the questions. I have found that this is not a good strategy. Do not read the questions before you read the passage. The reason is, well first off the questions waste time. You don't want to take time away from reading the passage. And more subtly than that is the idea that by reading the questions, they bias your approach to the passage. You're gonna be looking only for a certain thing or certain two things that you remember. And that actually, hurts your overall understanding of the passage. Sure it may help you with the specific detail questions, but in general, you are suddenly going to miss some important pra, points, especially the overall understanding of the passage and some of the inference questions involved. So therefore, go directly to the passage and make sure you are reading for general ideas. You are trying to see how the sentences connect, how the paragraphs connect. You're not, of course, simply trying to absorb every detail. But you are intelligently reading the passage, so that when you get to the questions, you have a sense of what that passage looks like. And that, of course, is gonna be a motif that I'm gonna keep pounding on understanding or having a conception of the passage when you get to the end of the passage, and before you answer the questions. And that will all come back to the idea of how to learn to read actively, something that I will be talking in the next, about in the next few videos. For now though, let's talk about getting the right frame of mind because I wanna keep things high level. And, very important, though often overlooked tidbit here is, getting excited about the passage. What does that mean? And why is that important? 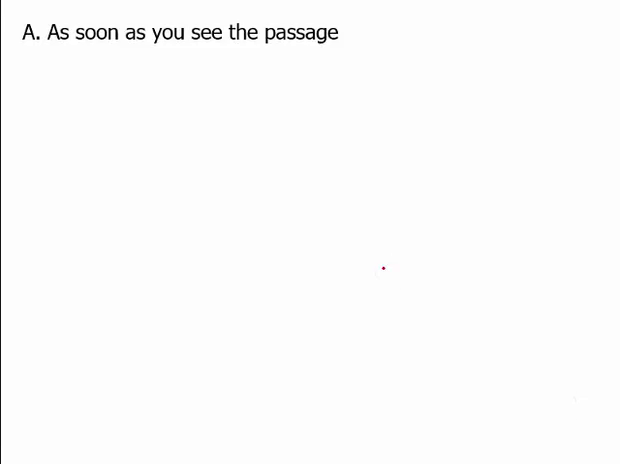 Well first off, you may have noticed the GMAT RC passages contain information that is very dull and very dry. Very academic and technical in nature. So it is almost everybody's default to get very bored very quickly when reading the passage so that your mind will wander after the first few sentences. However, I want you to think of this passage as something that is highly interesting that you are excited about. Of course, this is a trick you will have to play on yourself, psychology. Because most, meaning 99.8% of the population, is probably not very excited about the content here. But as long as you trick yourself, and you get excited about the passage, it's much easier to pay attention to what's being said. And more te, more importantly, to allow yourself to start connecting the sentences. Connecting the meaning in those sentences and the paragraphs that connect those sentences. Again, going back to what point. Creating a conception of the passage the first time you read it so that you understand it well. And when you go back to the passage to answer the questions, you know where the information is located and you have a general idea about the overall meaning of the passage. Of course, getting excited about the passage in the first place allows all of this to happen much more naturally. Again, anticipating structure is all part of that. You may also wanna pay attention to words that are technical sounding. For instance, there is a passage in the next video that uses the word oligodendrocyte, dendrocytes. See, I can barely even say it. The point is, 99.9% of the population has never heard of that word, and it's something that the passage defines. It's something that you should be paying attention to. Because of course you're in the right frame of mind. And it's something that will come up in the questions. So let's go on to a different topic in terms of a high level approach to the passage, and that is pacing. I think pacing is one of the issues that students struggle most with on the reading passages. And one of the reasons is they have a mistaken notion about how to improve. And that notions pretty simple, I will get better at the reading passage by reading faster. Learn to read faster that will unlock the passage and that is very far from the truth. In fact, that will hurt you far more than it will help you. So you will not get better by speeding up. You will get better at chunking information together. Not simply absorbing and rushing through, stringing word upon word, hoping that by the end, everything will come together in a sudden epiphany. That will not happen. It's about intelligently reading and chunking together, means bringing the main ideas from each paragraph and each part of the paragraph together in your head. So that you have again a conception of the passage. I know it sounds like I'm beating a dead horse, but it's gonna become a lot more compelling when I show you this in action in the next few videos by taking an actual reading passage. And applying these techniques so that you are chunking, not simply absorbing. And again, chunking is intelligently organizing this information. It's important to note as well that at first, this will slow you down, you are trying a new technique. And I'm assuming your GMAT is not three days from now. Probably don't wanna slow down, that you actually have time. To be able to apply this technique to realize that, hey, I was getting a little bit slower but I'm doing this new thing called chunking, or active reading, and that's gonna take me a little bit of time. But once you start picking up on that technique, you're gonna speed up and by the very end, you're gonna realize, wait a second, I'm actually reading passages faster than I was before because I'm an, anticipating the structure. I'm anticipating what's gonna happen in terms of the way the paragraphs connect. I make sure that I'm understanding the main ideas to each paragraph and pausing for a second to absorb that main idea before, of course, just moving on to the next word. And that is why many students do not improve because they think reading is simply stringing word upon word and speeding up that process versus learning how to read actively and to chunk information. Again, we will be going through this in the next few videos.